American Gods is one of Neil Gaiman's greatest works that's slowly making it way to the comics. If you've been dying for another incarnation, then American Gods: My Ainsel #1 from Dark Horse Comics can scratch that itch. The story is by Neil Gaiman, written by P. Craig Russell, illustrated by Scott Hampton and lettered by Rick Parker. Following along with Shadow and Wednesday is interesting because Russell infuses their dynamic with something of a buddy cop dynamic. That's not to say it hasn't been there to begin with, but Russell uses it to great lengths to give readers more insight into what makes Wednesday tick through his recounting of grift tactics. Having him recount those ruses is actually very entertaining and really draws all the narrative attention; it feels that everything happening with Shadow is mundane by comparison. Russell also leans heavily on narration himself, filling the book with an abundance of direction for both the story and reader. There's a sufficient level of atmosphere throughout as well as Russell realizes that the world of American Gods is one rife with deeper meaning and existentialism. Hamptons illustrations are very haunting in their simplicity. Shadow and Wednesday look familiar enough, but the settings they're traveling through are rendered so that all the focus is on the character seemingly operating in a void of space. It's almost as if Hampton realized that a painter's style would give the book more of an ethereal sensibility that's befitting of the American Gods universe. In fact, the way Hampton illustrates everything is downright eerie; it's almost as if the entire book has an ominous cloud hanging over it. Hampton's colors further this effect, relying on very dark blues and dull grays to set the mood. American Gods: My Ainsel #1 is another entry in the comic series that works to adapt the books. Shadow and Wednesday are a seemingly odd pairing brought together by even odder circumstances, but that doesn't stop them from making their way. Russell's script is heavy on narration and storytelling. Hampton's illustrations are the perfect fit for the tale in that their sufficiently haunting. 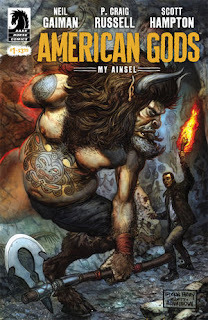 American Gods: My Ainsel #1 is definitely worth checking out if you're a fan of the series or looking for something interesting. American Gods: My Ainsel #1 is available now.